Chara at first appears more like a submerged plant, but it is not rooted to the bottom of the pond or lake. This gray-green branched algae is oftentimes mistaken for a plant because it has stem and leaf-like structures. Two key features that differentiate Chara Algae from other aquatic plants are its smell and texture. 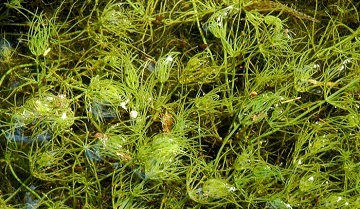 Chara Algae has a foul almost garlic-like scent that becomes more prominent when it is crushed. The texture of this algae is very grainy, and when left in the sun for just a few hours will turn ashy and grey. In addition, Chara Algae will not grow out of the water and doesn’t flower like most plants.